This is a caution. The author’s descriptions of how he felt his way as a young man by intuition – on stoned walks home from friends’ – towards something he later recognised as psychogeographical sensitivity is followed by a long and (sometimes for the reader) arduous pilgrimage through multiple texts. Yet he does not generally recognise these as texts, but as some kind of literary Akashic records, the documentation of the ‘real’ and ‘authentic’ underlying truths of every-space. What was engaging, somatic and alive in his youth has become dogma and generalisation. In the process Glastonbury, in all but idea and icon, gets largely ignored. Briefly there is a meditation on a roundabout and events around it, but there is no attempt to describe the nexus of site and event, of fake megalith, arson at McDonalds and Legionnaire’s Disease. There is no explanation of how these meshwork works or how one thing connects to another; except that somewhere in the authentic reality there must be a connection, so there is. The heightened sensitivity of those early walks home is dulled. Briefly to return in an excellent passage where questing, visualisation, sleep deprivation, river garbage, a giant fish, hidden chambers and the ‘Apocalypse Now’ soundtrack are piled layer upon layer. Paul Weston early on claims a unique psychic connection between London and Glastonbury, based upon the second homes of a few well-healed writers. The same connection can presumably be made in a number of picturesque market towns. This shaky bridge is then used to march across into Avalon a host of occult metropolitan tropes from Iain Sinclair, Alan Moore and Mrs E. O. Gordon. The most depressing of these is yet another retread of the Ripper story, the most irritating is the umpteenth failure by occult writers of site to recognise that, rich though it may be with odd geography, Mrs Gordon’s ‘Prehistoric London: Its Mounds and Circles’ was written for the British Israelites, an anti-semitic organisation convinced that the British are the ‘real’ Jews, and whose members played a role in the founding of the neo-Nazi National Front in the 1960s. Somehow the fact that there have been two murders in Glastonbury brings the Ripper narrative into significance. ‘Narrative’ Weston respects books, and specifically their storylines (rather than language or stylistics). He concludes, again on flimsy and ghoulish evidence, that his town is replaying each year, in disguised form, the plot of John Cowper Powys’s A Glastonbury Romance. The problem is not so much the fuzziness – he declares with admirable candour “[I]f historical research could show that some of the material was accurate, and none of the details necessarily inaccurate, then it was considered acceptable to take a gamble” – but rather that by this wobbly methodology he claims authenticity, access to real histories and true powers. He misses the psychogeographical fun in how access to these revelations is accompanied with crashing into dirty rivers, watching “four horror movies in a week” (blimey) and the smoking shell of a fast food restaurant. Citing Rimbaud, with respect, for “his cultivation of the art of hallucination” Weston mistakes artifice for authenticity, bypasses subjectivity, and takes the word for the thing, alchemically reprocessing coincidences into solemn destinies, and the playfulness of life into “an ideal harmony that brings together the laws of heaven and earth through the geometrical forms of divine creation” Symmetry and reflection replace that lovely diffraction and entanglement of Weston’s early years, and Glastonbury mostly disappears. Most disturbingly, Glastonbury Psychogeography claims to make a deep exploration of the dark energy at work in this much-iterated town, foggily invoking two murders (five minutes of online ‘research’ threw up a very different narration for one – a campaign against a miscarriage of justice). Yet perhaps the darkest energy is invoked by the words of the book itself, joining the literary dancing on the graves of the women victims of ‘Jack the Ripper’, citing as central authority for spiritual Glastonbury an author whom Weston freely admits inflicted genital mutilation by surgery on his wife (followed by a telling “And yet...”), and the endless filling of the void (common to these market towns) with occult genealogies and spectral processions of Grail Knights, when the silent trauma of, for example, the purloined fruits of colonialism (continued by the intense, multiple cultural appropriations on display in Glastonbury) is never once addressed. In his final chapter, Weston launches an assault on hypermodernity and its “non-places”; and yet it is his hyper-occultism that makes Glastonbury a non-place here. 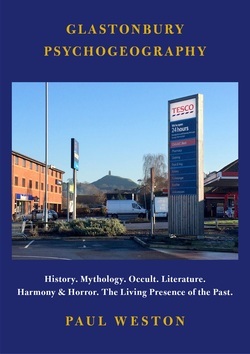 He might claim to be setting the “Perpetual Choir and the Fisher King against Colonel Sanders, Tesco and the super-modern non-places” but what is most exciting for a psychogeographer in this book is how similar it makes them all. On page 1, the author cites “the Magical Battle of Britain”; the conclusion reveals the contemporary participants as double-agents.